This is a book I HAVE TO read! And yes, the story is just as delightful and intriguing as it sounds. 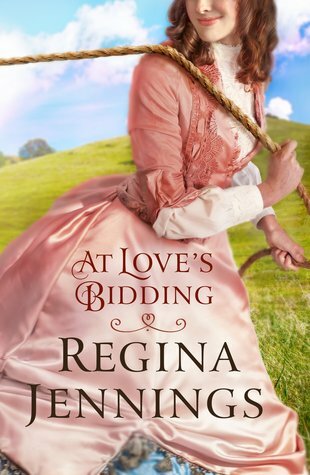 It is a delightful story that makes me want to rush out and find every other book Regina Jennings has written! And don’t miss out on the AWESOME Facebook party and chance to WIN cool stuff! After a cross-country trip to track down a sold painting that could ruin her family’s business forever, Miranda Wimplegate forms an unlikely but charged partnership with livestock auctioneer Wyatt Ballentine in Regina Jennings’ At Love’s Bidding. Miranda and her grandfather discover their new auction house doesn’t deal in fine antiques, but in livestock. And its frustratingly handsome manager, Wyatt, is annoyed to discover his fussy new bosses don’t know a thing about the business he’s single-handedly kept afloat. Faced with more heads of cattle than they can count–but no mysterious painting–Miranda and Wyatt must try and prevent a bad situation from getting worse. Join Regina in celebrating the release of At Love’s Bidding by entering to win her Cozy Winter Night giveaway andRSVPing to her January 5th author chat party! Regina Jennings is a graduate of Oklahoma Baptist University with a degree in English and a history minor. She is the author of “A Most Inconvenient Marriage,” “Sixty Acres and a Bride,” and “Caught in the Middle,” and contributed a novella to “A Match Made in Texas.” Regina has worked at the Mustang News and First Baptist Church of Mustang, along with time at the Oklahoma National Stockyards and various livestock shows. She now lives outside Oklahoma City, Oklahoma, with her husband and four children.